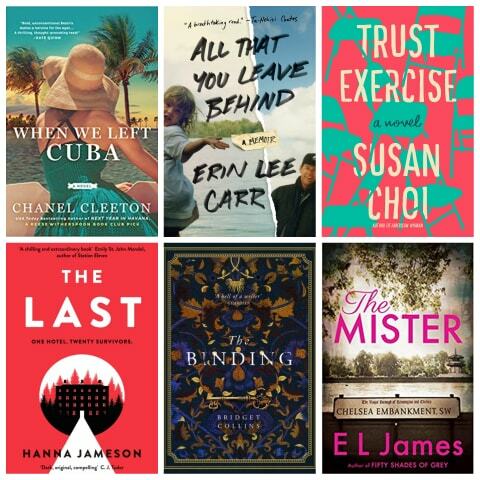 April 2019 is a busy month in the publishing world, which is great news for those of us who are gearing up for Summer Reading! Whether you're into memoirs, romance, thrillers, historical or literary fiction, this month has a hit for you to enjoy. Here's a look at a few April reads that immediately caught my attention. Smash that "hold" button or keep your eyes peeled for a Lucky Day copy in the stacks. WHEN WE LEFT CUBA by Chanel Cleeton - Okay, so I literally cannot wait to get my hands on this one. Set in the aftermath of the Cuban Revolution, a ruined heiress turned spy will stop at nothing for revenge. Falling for the enemy complicates things and THAT ladies and gentlemen sounds like a perfect historical romance. I mean, right?! ALL THAT YOU LEAVE BEHIND: A MEMOIR by Erin Lee Carr - Erin is the daughter of David Carr, legendary New York Times columnist. Turns out that the apple doesn't fall far from the tree, and she is also an amazing writer. She has gifted us with this clever, candid, and touching memoir that's molded around over 1900 pieces of correspondence between her and her father before his sudden death in 2015. TRUST EXERCISE by Susan Choi - This one is here for your weird read needs. Set in the 1980s and revolving around the lives of students at a posh performing arts school, it's been lovingly described as "unsettling", and will you make you question everything you thought you knew. It's just begging to be turned into a hit TV series (looking at you, Netflix). THE LAST by Hanna Jameson - I am a sucker for apocalyptic fiction, and The Last sweetens the plot by throwing in a murder mystery. The protagonist is far from home in a Swiss hotel when nuclear war breaks out, forcing him to team up with 27 strangers to find a way to survive. Not easy when one among them is also killing folks! THE BINDING by Bridget Collins - Combining magic and books is a good way to pique my curiosity. In this tale, books are forbidden vessels of indescretion rather than entertainment (which is a crying shame). The protagonist becomes a book binder, trapping peoples' secrets between the covers, until he finds a book in the catalog with his own name on it. Dun, dun, dun! THE MISTER by E.L. James - This is not a drill. The Fifty Shades author has a new novel and this time the rich, handsome guy who is weirdly obsessed with an enigmatic young woman is named...Maxim Trevelyan. He is British and James has actually been applauded for capturing a vivid portrait of England. If this book doesn't deliver the goods, at least we know the Goodreads reviews will.